BeamSystems is a rental company for a selection of AV products, they use the latest products on the market and advanced audio-visual projects are realised by their experts. In the beginning of May, BeamSystems invested in a d3 Technologies 4x4 pro media server. The d3 4x4 pro is an addition to their existing range of media servers and is available in their rental fleet. This media server supports the full video production process; from design till the final show. The d3 4×4pro sets a new industry benchmark for power, flexibility and convenience. With the d3 4×4pro, big shows are easy. The d3 4×4pro packs enough power to push every pixel over four 4K outputs, or sixteen HD outputs. This means one d3 4×4pro can replace four conventional media servers with four outputs each. The d3 4×4pro can play up to 32 HD layers of DXV/HAP content, and split this up however you like, with canvas sizes up to 16K pixels across. To meet clients in need of expertise around this media server, the technical crew of BeamSystems took a training on d3’s media server workflow. 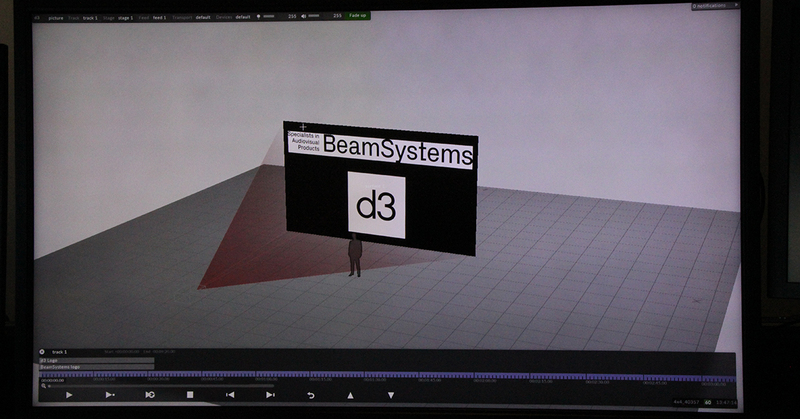 The technical crew learned to work with d3 Designer, the software only version of the d3 production suite. From conceptual pre-visualisation through technical specification, sequencing and content compositing all the way to technical set-up, d3 Designer is the flexible but powerful solution.